OAFE - It's the Great Pumpkin! It's the Great Pumpkin, Charlie Brown (1966) was the third Peanuts special (after A Charlie Brown Christmas and Charlie Brown's All Stars). Like Christmas, Great Pumpkin quickly become an annual event on ABC that continues to this day. Over the years, the Peanuts gang have become a bit dated. This is partly due to the lack of new television specials and the end of the daily strip two years ago (sadly, creator Charles Schulz died in February 2000, the very day the last original strip was published). But more broadly, Peanuts (originally titled L'il Folks) was both a product and an icon of the Baby Boomer era and those associations have held. Whereas the ideas spouted by the surprisingly precocious children were probably a wee left of center in the 1950 and '60s, the series is now looked upon with fond nostalgia by all. Perhaps most interesting is the notoriety of A Charlie Brown Christmas as one of the few salient pop culture acknowledgements of Christmas's religious origins. This is fondly looked upon by some, while others look at its cynically, cynically noting that Charlie Brown Christmas is more faithful to the origins of Christmas than most Americans of the '00s. Nevertheless, Christmas's anti-commercialism message was prescient and preserved the show's relevance for forty years. The Great Pumpkin does not boast such an overt message, but it does have a few more subtle ones about the nature of faith (or, for the cynical, a commentary on the absurdity of existence). More importantly the special solidifies the character traits that had been developed over fifteen years of comic strips and two previous cartoons. Charlie Brown is cursed but persistent, getting rocks in his trick-or-treat bag to complement his inept ghost costume; Lucy's witch costume ruthlessly reflects the dark soul within; Snoopy, the non sequitur incarnate (in this episode at least), roams around after the Red Baron; and Linus plays both Didi and Gogo, waiting for his own personal Godot, the Great Pumpkin, in the "most sincere" pumpkin patch in town (of course, Waiting for Godot didn't offer anything in the way of Lucy's cathartic rant against Linus for robbing her of potential "tricks or treats"). It's interesting how, in an era where the Tooth Fairy drops off $10 bills, the Easter Bunny leaves at least a present or two and Santa Claus commands a merchandising force equitable to the military of a small industrial nation, that the Great Pumpkin never caught on as yet another excuse to give kids presents on non-birthdates. I suppose with all the decorations, costume rentals and cubic tons of candy, people figure Halloween is expensive enough. Since the legend of the Great Pumpkin didn't take root in popular culture, I imagine many kids often wondered (as I did) where Linus came up with the bizarre notion of the Great Pumpkin in the first place. Did it come to him in a flash as he sucked his thumb and cradled his blanket, blazing before his eyes like a prophetic vision? Did he find a reference in some obscure grimoire of ancient druidic lore? Linus was obviously the most intelligent of the Peanuts, so this erratic behavior seems all the more troubling. What does he know that we don't? Laugh if you will, but I'm actually being half-serious here. There were often subtle existential and philosophical themes woven in and out of the Peanuts' adventures. The equation of the Great Pumpkin with Godot may not be as far-fetched as it sounds. Charles Schulz was the innovator of a kind of popular, intelligent comic strip that is rarely seen today - his two greatest successors, Berkeley Breathed and Bill Watterson, are already retired themselves. In the last five years we have seen toys based on the unlikeliest properties, and holiday specials like The Great Pumpkin are no exception. Playing Mantis has already had tremendous success in its Memory Lane brand with action figures and other collectibles based on Rudolph the Red-Nosed Reindeer. This year they're seeking to duplicate that success with a line of Peanuts figures. Some are just normal figures, while others are based on particular specials. Just in time for Halloween, the It's the Great Pumpkin, Charlie Brown figures can be found at retail stores near you (as well as online shops, of course). The Rudolph figures were made in a relatively normal 6" scale and executed very well, with great accessories, articulation, and paint applications (not to mention great sculpts). With the Peanuts, Playing Mantis seems to have decided for a completely different take. The figures are in the 5" scale, but this makes them extraordinarily large in comparison to other figures. Since the Peanuts are children, it's somewhat disconcerting to see them stand next to my Simpsons figures - they're just as tall, but with vastly different proportions. The scale is the first thing you notice about these figures, and it's probably my biggest problem with them. Smaller, solid plastic articulated figures would have been preferable to these large, soft-headed figures. But I admire Playing Mantis for its attempt at a somewhat more innovative approach. There's clearly some influence from the aforementioned Simpsons line, since the Peanuts sport limited articulation (including motionless legs) much like the denizens of Springfield. Unfortunately, PM has less of an excuse - the Peanuts figures feature no voice chips like the Simpsons do. The two sets I got were actually 3-pack exclusives from Target; the figures are also sold individually. In addition, there appear to be variations in the expression of the kids: mine are all grinning like madmen, but apparently there are also figures with concerned or thoughtful-looking expressions (which, I admit, are probably more faithful to the spirit of the series). The nice thing about these sets is that the "Great Pumpkin" aspect of the toys comes out in the accessories, not the figures themselves, meaning once Halloween's over you can pack the pumpkins and the ghost outfits away and still have some Peanuts to display. A note on opening the packages: the 3-packs come with a nice inner cardboard backing that, if you're careful, can be separated from the box and taped plastic parts and used as a pumpkin patch diorama. As I said, the first thing you notice after opening these things is the scale. Their heads are huge and soft, like the old He-Man figures, or the Care Bears figures. Charlie Brown's head in particular is so huge and round...it's like a big pink planet. It confounds me. It vaguely threatens me with its supreme roundness and pinkocity. So I immediately sheathed him in his fabric ghost costume and have not released him since. That spherical pink... thing is just waiting, waiting for me... (ahem) But I digress. The other heads, while still huge, do not share that frightening sense of hypergeometric spherical perfection, like something from the eldritch land of R'lyeh. It's difficult to translate the simple designs of two-dimensional cartoon characters into three-dimensional figure form; Playmates learned that the hard way. But there's one basic rule: the more simplistic the design, the smaller you can go and get away with it. These figures, while ostensibly geared toward the collector's market, look like something you'd give a three-year old. Perhaps an infant, its mind yet unable to comprehend the horrific implications of Charlie Brown's perfectly spherical head, would enjoy gumming it. I think a smaller scale - perhaps on par with Hermey the Misfit Elf from the Rudolph line - would have worked better for Peanuts. It would have allowed for more dioramas and probably would have made more sense from a collector's standpoint, since smaller figures means more characters. Of course, Peanuts doesn't have a fraction of the cast that The Simpsons does, so perhaps Playing Mantis is attempting to maximize the amount of pure bulk figure they can sell. "Look at the size of that boy's head! I'm not kidding, that's like an orange on a toothpick! That's a huge noggin! That's a virtual planetoid!" I have no complaints about the sculpts; they look like their cartoon counterparts, which is as much as one could ask for. The articulation is pretty basic, allowing them to move their arms up and down, primarily. Schroeder, unfortunately, can't move his legs, thus freezing him in a sitting position for all eternity. Since I can only think of one or two times that Schroeder walked anyway, that's no big deal. Snoopy has some interesting articulation: his waist and feet can be turned so that he's sitting down, but it's not exactly natural articulation. Another annoying point is the hands - none of them have hands designed to hold anything, which complicates things when we get to the accessories. 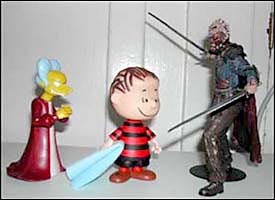 The accessories, of course, are what distinguishes these figures from the "regular" Peanuts toys. 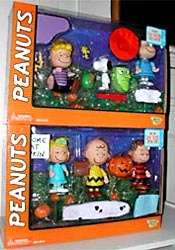 Each figure comes with a plastic "pumpkin patch" base (see the pic of Charlie Brown, above). There are no pegs on the stands or holes in the figures' feet, but they're so large and have such big flat feet that standing up isn't an issue. In fact, the pumpkin patch stands - all of which are identical and don't link together - are fairly useless. Linus comes with a rectangular patch of fabric, which is, apparently, his blanket. It's too bad there's not some sort of quilted edge, but it seems obvious corners were cut here; Snoopy's scarf, for instance, is no more than a bit of red ribbon. Sally's "Welcome Great Pumpkin" sign has nothing to stick into, and she can't hold it. 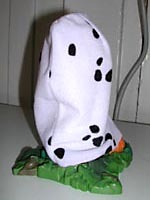 There are no holes in Charlie Brown's costume, so the figure can't be seen when he's wearing it (which is fine for me, of course, since his head terrifies me, but I'm sure others would have appreciated the ability to actually see the action figure they purchased through the costume). But most annoying of all is Lucy. Lucy, of course, is the manifestation of evil in the Peanuts mythos. 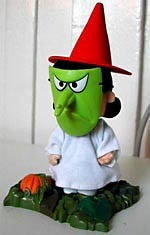 In The Great Pumpkin she makes a crucial misstep by choosing a costume that blatantly reveals the rage and desire for power that seethes just below the surface. Look at that face! Of course, her evil seeps through even into her figural representation. While the white fabric outfit goes on fine, the mask refuses to remain on, and the hat - despite being molded around her hair - absolutely refuses to do any more than precariously balance on her head. It's this kind of inattention to detail that mars my perception of this line. I want to like it, but it just seems so rushed. But it's not all bad news. 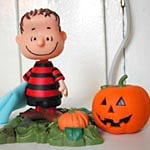 Linus comes with a big pumpkin that glows red when you press down on it, which was a nice surprise. While I've nitpicked here and there, I haven't had a sense of disappointment with the figures as I sometimes do. They're too cute not to like. They're perfect for a seasonal display, which was my main reason for picking them up in the first place. I suspect they'd also be fun for kids, particularly little ones (if you took away all the small parts, of course). 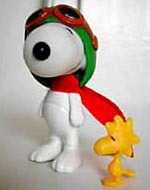 In sum: I do recommend these toys to Peanuts fans and even casual fans looking for a figure or two. Just watch out for Chuck's head. That thing is round.